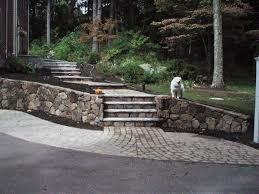 Learn about our Walkway services and request a free in-home consultation. We can create an inviting walkway that will enhance your front entry or create a unique path to your backyard, patio or pool area. Perhaps you have a hillside that is difficult to navigate; a natural stone stair case with slate or stone paver steps can add texture and color while serving as a practical means of accessing the yard. At P&C Stone Work and Landscaping, we offer a wide variety of materials for our stone walkways and paths and work closely with our vendors to make sure that we provide the best quality materials for our customers. No matter how small or large, simple or complex, our landscape designers are ready to work with you to create a walkway that will be both inviting and compliment your landscape. Request a free consultation with one of our landscapers today. Our patios and walkways are designed and constructed in all different shapes and sizes, using a variety of materials. We have an abundant selection of natural and man made products we recommend that are extremely durable and non slippery. We guarantee and stand behind all of our workmanship and installations.